Powers: Enhanced strength (Capable of lifting 10 tons). Equipment: He also carries an indestructible adamantium shield modeled after Captain Americas first. Lamar was a northern African-American who as a child was a big fan of “Isiah Bradley” though he thought he was an urban myth. As a young man he joined the United States army where he met John Walker. At first Lamar thought that John would be racist but instead they hit it off quickly and became best friends. After serving their term with the military they signed up for the power brokers experimental strength augmentation process. It worked on both of them but instead of going into “Unlimited class wrestling” Walker convinced Lamar to become of his buckies while he would become the Patriot [Captain America Vol.1 #372]. Alongside his fellow Buckies they staged an attack on the Patriot to give him public appeal. They later attacked Captain America to test out their skills but were defeated [Captain America Vol.1 #323]. When Steve Rogers walked away from the Captain America mantle and was chosen as his successor Lamar became the new Bucky [Captain America Vol.1 #334]. Whenever they were not on a mission they were practicing to become world-class fighters [Captain America Vol.1 #372]. On their first mission out Lamar was almost hanged by the Watchdogs group [Captain America Vol.1 #335-#336]. He debuted a shield later while battling the secret empire and the commission on superhuman activities [Captain America Vol.1 #338]. After learning that the term Buck was a derogatory name used by slave owners to describe their male slaves. A “Buck’ was a male slave used to impregnate a bunch of female slaves much like a prize bull is used on a cow farm. 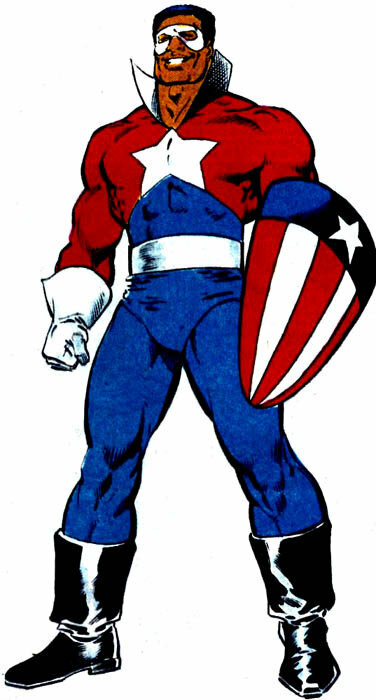 As a result he changed his costume and name to “Battlestar” [Captain America Vol. 1 #341]. The duo next battled the resistant’s after they captured Quill [Captain America Vol. 1 #341]. When John Walker killed the men who had gunned down his family, he was benched. Battlestar had to work with Freedom Force for a time [Captain America vol. 1 #346]. After a falling with Walker he partnered with Steve Rogers who was “The Captain” at the time [Captain America Vol.1 #348-#350]. This eventually led to Steve taking back the Captain America Mantle and holding a press conference to symbolically hand back the shield. At the event John was shot four times in the chest and Lamar witnessed his friend’s demise. That night however Walker’s body mysteriously vanished from the morgue [Captain America Vol. 1 #351]. Even though he was given options to continue working with the government he left [Captain America Vol.1 #352]. Lamar then investigates the claims made about the body’s location. His investigations lead to him confronting the serpent society; which included Cottonmouth, Bush Master, Rock Python and Puff Adder; and meet the Falcon [Captain America Vol.1 #353-355]. Lama eventually tracks down Walker who had become the US Agent and was a member of the West Coast Avengers. Upon meeting with his friend however he found that he now suffered from amnesia [Captain America Vol.1 #372]. Walker attacked Lamar when confronted with his past. The west coast Avengers had to break up the fight. Lamar was then ambushed by the Power Tools which included Buzzsaw. Though he out fought them when his friend’s life was threatened he turned himself over to them [Captain America Vol.1 #373-#374]. Once secured he was subjected to the de-power machine of the power broker [Captain America Vol.1 #375].After the process he was left emaciated and barely able to walk. Lucky for him USAgent showed up at the last-minute to aid him [Captain America Vol.1 #376]. Together they rescued the captives and made peace with each other [Captain America Vol.1 #377-378]. When Silver Sable and her Wild pack were having issues dealing with some racist villains Battlestar offered her his help [Silver Sable and the Wild Pack #3]. While on the team he had to deal with Doug Powell, who hated blacks. Impressed with his skill and heart Sable made him a member of her team [Silver Sable and the Wild Pack #4-5]. While serving the team he also met Deathlok [Silver Sable and the Wild Pack #6-7].He was the one who later rescued Man-Eater when the team liberated the test subjects of the “Genesis Coalition” [Silver Sable and the Wild Pack #8].After battling the Bio-Genes in Somalia they take Lightbright back to America [Silver Sable and the Wild Pack #16-17]. They then start dating [Silver Sable and the Wild Pack #20] and Lightbright joined Sable’s Invaders [Silver Sable and the Wild Pack #21]. He rises to the rank of field leader in Silver Sable’s absence and remains with the team until they disband [Silver Sable and the Wild Pack #22-27]. After the Stanford incident involving the New Warriors and the onset of the superhuman registration act which erupted in Civil War between the United States Superhumans, Battlestar opposed registration despite his identity already being known by the government. Him and a group of relative unknown super-humans met with reporter Ms. Floyd. When they were attacked by S.H.I.E.L.D he used all his efforts to ensure she escaped but he was knocked unconscious in an explosion and captured [Civil War-Frontline #4]. They were not sent to the negative zone prison crated by Mr. Fantastic [Civil War-Frontline #5].It’s revealed that during the explosion he had a piece of shrapnel lodged in his spine [Civil War-Frontline #6]. He continued to recover even after the War was over. He returned to active duty aiding the Guardsman Alpha Squad while they were investigating the project Pegasus. While on this mission he fought the Squadron Supreme. After this Battlestar was recruited into A.R.M.O.R the Alternate Reality Monitoring and Operational Response Agency to help prevent a Zombie invasion from another dimension.